Spriiiiing! It makes me so happy. Winter was mild this year but I LOVE the daylight, everything growing, getting outside more, and transitioning from wintery foods. April was fun with a more social opportunities than I sometimes have with friends and a few fun family festivities. I think our energy is up! I feel like I’m being more realistic about what’s possible in the kitchen and I’m being OK with setting the priority that we eat together and eat different things, but I’m not forsaking all else to stick to my dinner plan. Seeing the little babe smile on the swing when her big brother pushes it when we get home is worth wayyy more than the meal prep I otherwise could make happen that night! 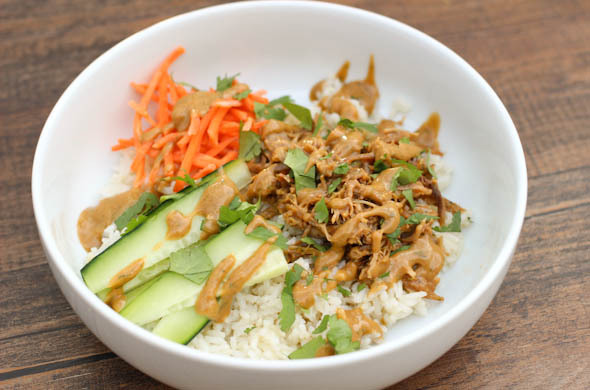 I love a grain bowl and these Thai Coconut Rice Bowls with Pork were such winners. The pork was leftover from a crockpot pork, the rice was ready in 10 minutes from the pressure cooker, and the sauce I zipped together in the blender the day before. I need to perfect my salmon cooking. 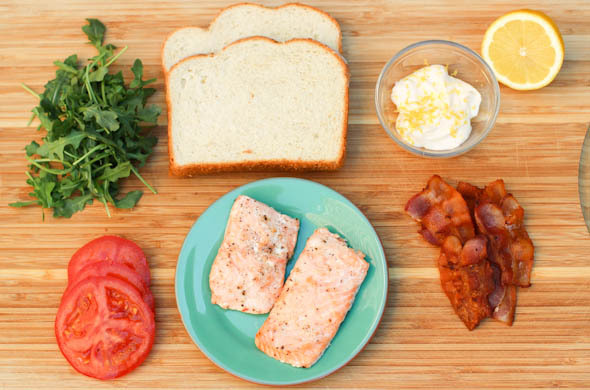 I overcooked it but the leftovers were perfect in a Salmon BLT with lemon aoli. Next month I have some good stuff coming! I have a burger, a breakfast, and a few other things. She’s so fast and so strong. She was pulling up to stand before quite hitting 8 months old. All she wants to do is stand! 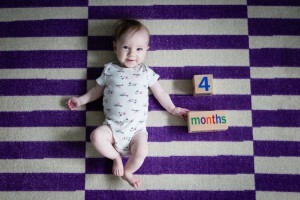 She’s a quick and quiet crawler who can disappear to explore before you know it! I’m so proud of her sleeping skills, though I’m sure daycare wouldn’t mind her sleeping more there! She has 2 little chiclet teeth on the bottom and wants to eat everything. She’s loving the swings and chewing on T’s raptor dino that is unofficially regulated to being hers now. Her teachers at a daycare-wide dance party swooped her away and brought her around to see everyone. They really love her. She’s so happy and chill even when hungry or tired. We got bows to keep her hair out of her face and they’re just too cute. He’s sooo into favorites right now. What’s your favorite dino? What’s your favorite fork? What’s your favorite color on this picture? I forgot that that’s a thing for kids. He loves the baby and is a fantastic big brother. It melted my heart when he said he “just wants to be 6″ why I asked, “because then C will be 3 and we can play more.” I’ve loved doing puzzles with him. I think he over-does it on some favorite foods and thinks he wants them but then isn’t really into it- like certain cereals. It seems he will always want pasta, bananas, and avocado. He likes all candy- even junky stuff from a town egg hunt. I loved watching him at a daycare-wide dance party. He wanted to participate, was a bit reserved, then got into it. He thrives on having close friends. I missed the deadline for town soccer so he’s doing a little community one. We’ll see where his comfort-level is. He’s been happy on bike rides with Daddy but also is doing fantastic on his balance bike. His love for library books rivals mine. Year of ___ decluttering/minimizing/organizing: ehhh. All I did was pull together items for a clothes swap at work. We have a bunch of baby equipment earmarked for a yard sale. Feeding Littles: I shared dinner of shrimp with Trader Joe’s Island Soyaki sauce, brown rice, edamame. He wasn’t into the shrimp that night but liked it when he had rice in the same bite. Work on advanced food prepping: A day-off mid-month was huge for this! I cooked and blogged 3 things! What I’m reading: I read An American Marriage for bookclub and really liked it. I read China Rich Girlfriend and loved it as much as the first in the series. March just wizzed right by! My birthday kicked off a fun month! I’m feeling like we are so much more in a groove and all doing really well! The babe is so happy and now quite predictable. The little boy has loved the snow and more daylight is so great for us! Mr. J and I are on a roll. Work has been super busy- which I love. We all were sick through March so we were all to ready to be better and healthy after colds, seemed-like-strep, a stomach bug, and a perpetually runny baby nose. 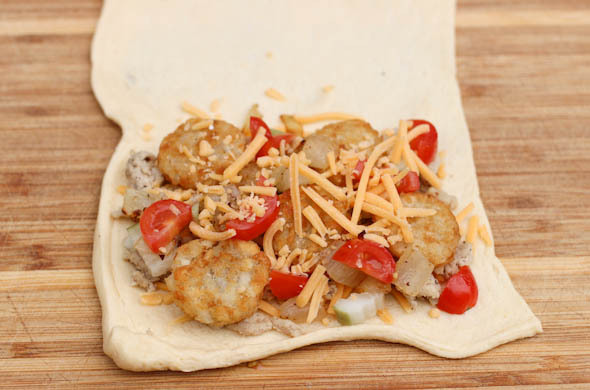 I made these cheeseburger turnovers with tots in them and they were so fun and an ideal one to prep in advance. 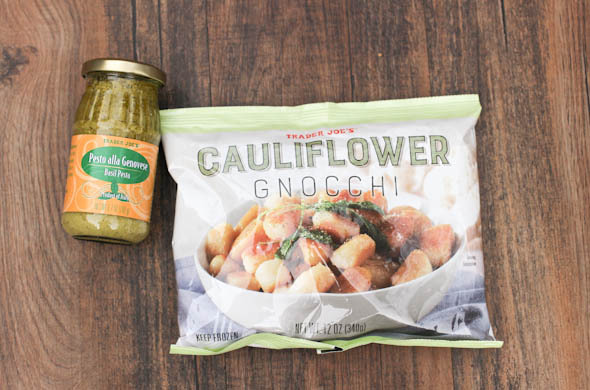 I took a Trader Joe’s haul to the next level with tips to take Trader Joe’s items and turn them into a full meal. 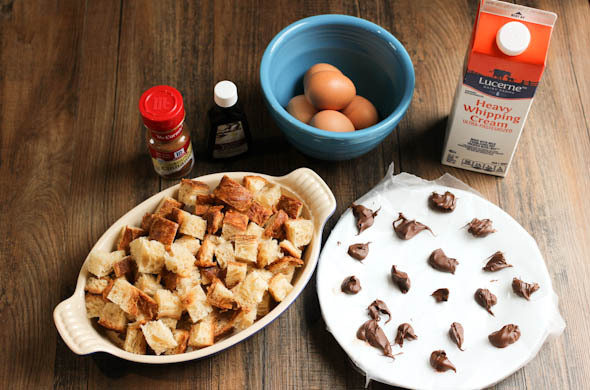 I also made a nutella croissant baked French Toast and LOVED it. My nutella tip is key! Next month will have a rice bowl and a sandwich and I’m not sure what else. We are heading to Maine for Easter. I will probably make a Carrot Cheese Ball. 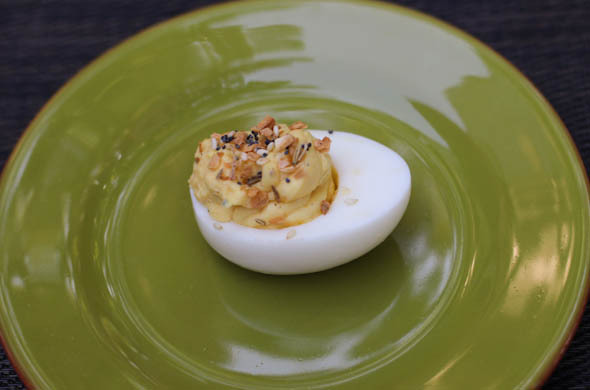 I also make some chocolate peanut butter eggs to have at home. What a happy lady! She sits up and suddenly started going from laying to sitting- transitions hadn’t been smooth until just now! Baby C is eating and loving it. We are working her through all the baby foods to ensure there aren’t allergies and also we need her to eat enough to be a meal before reducing to fewer bottles because of her challenge to gain weight. She has 2 bottom teeth that popped through. She loves to bite on everything. He love love loves playing in the snow. Now that it is gone, we’re mucking around in boots and getting outside more. Thank goodness! He’s very into PJ Masks which isn’t my fav. I love seeing how many books he’ll dive into in a row. Some meals he gobbles them up quickly and wants more, other meals take for-ev-er. Breakfast for dinner of eggs and sausage is a current favorite. He likes “snacky lunch” meaning- not a sandwich. Year of ___ decluttering/minimizing/organizing: ehhh. I didn’t really make it happen. I hope to tackle the kitchen utensils. Feeding Littles: I shared a repeat dinner I made before- we did of “Pizza” polenta bowls with white beans- for all. Work on advanced food prepping: I did this pretty well this month with some morning prep to give me a head start. What I’m reading: I read The Slap for bookclub and none of us enjoyed it. I also read Today Will be Different and The Map of Salt and Stars which was so amazing. What I’m watching: We watched Three Billboards Outside Ebbing Missouri and was blown away. So good. We also watched Tag and laughed out loud. The little boy watched a few movies. Snow days and sick days seemed like good times to snuggle for movies! He liked Moana and Trolls. 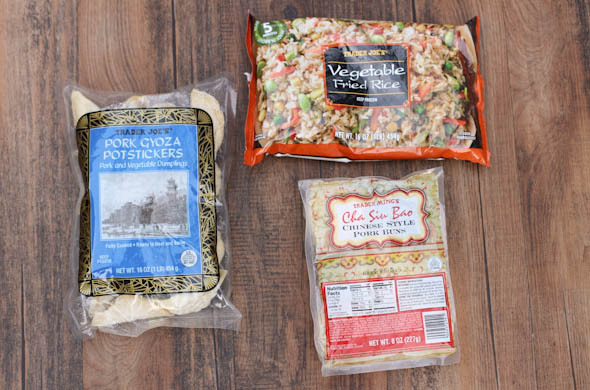 Every influencer can show you their Trader Joe’s haul, but it is easy to leave Trader Joe’s with fun things that don’t really get you closer to a complete meal. I don’t pretend anyone can/should do all their grocery shopping there, but Trader Joe’s is suchhh a lifesavor at this stage of my life for meal starters or a hands-off main dish! These shortcuts to getting varied dinners on the table is a huge asset to me. If I’m not strategic shopping at Trader Joe’s, then I do leave with fun things that have me scratching my head of how we’ll eat them or did I just spend $50 on things that don’t go together and I’m still not ready for dinner? I usually make the rice that morning, or the night before, to speed us up. The package comes with 2 packets of sauce so making half is an easy option. The breaded chicken is baked then gets tossed into a sticky sweet sauce. This is a true fav of ours so we make the whole thing for 2 adults, 1 preschooler who eats like a teenager, and a leftover serving for lunch. He looooves popping edamame out of the pods too so it is fun to eat a veggie in a different way. TJ pesto is the best out there- of any brand. It freezes well too if you don’t want it too often when opened. The frozen cauliflower gnocchi is such a hit for TJ fans. It does taste like cauliflower but the true trick is that it shouldn’t be prepared according to the package! Saute in a pan with just a tiny bit of water. Get it some toasted/golden sides and toss in pesto for big enough flavor to lean towards gnocchi instead of cauliflower. Make 2 packages if serving more than 2 people. For 2 adults and a little kid, 2 bags are really necessary. This is a 10 minute dinner in 1 pan. Done. I love plain kitchen ready tomatoes instead of regular sauce but Trader Joe’s has some good sauces too! Their pasta there is always super cheap but I had some on hand. More importantly, the eggplant. It is the best, and one of the only places to find it! 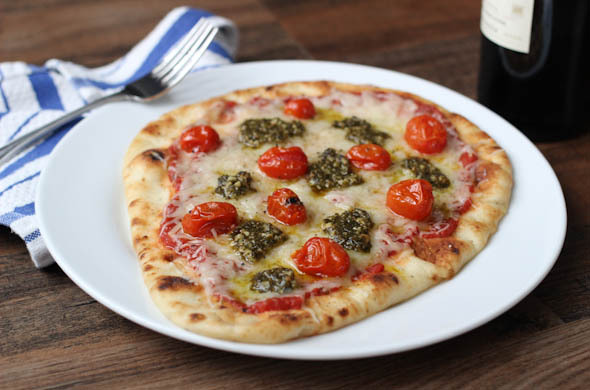 I love it to be eggplant parm, eggplant parm subs, on pizza, in calzones, in grilled cheese even, and it is great as a stack with cheese, sauce, and the above pesto! Because it is frozen it is easy to pop a few into the oven or toaster oven! The veggie fried rice only takes a few minutes to cook in a pan and while we love it, I think it needs a little drizzle of soy sauce or teriyaki sauce. The pork potstickers are great and easy to make just a few. There are always other fun Asian inspired frozen foods to mix & match like bao buns, spring rolls, etc. I also like to cook a few pot stickers alongside sesame noodles. 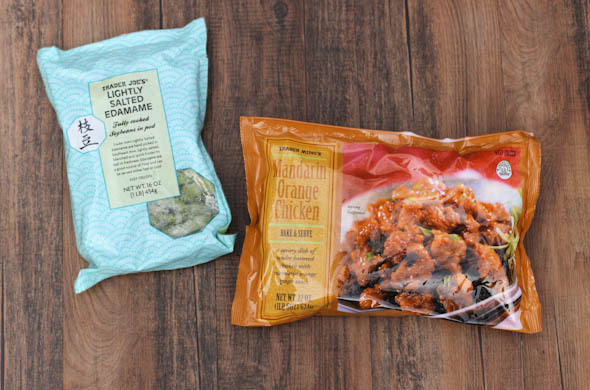 These freezer goodies really make dinners feel different. Roasting some broccoli then topping with a sprinkle of black sesame seeds is a simple side. I’ve also tossed cucumber in sesame oil & rice vinegar for a 2 second side! 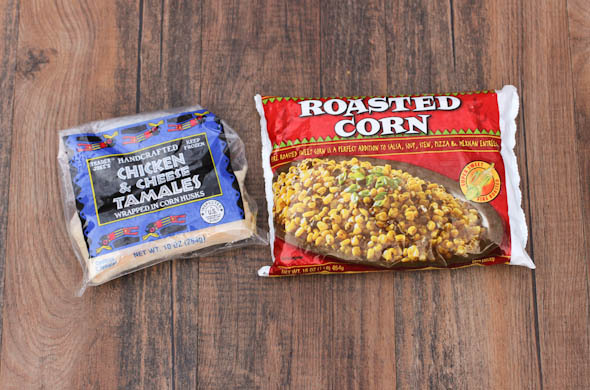 The roasted corn is so fun and a great side to tacos or inside burritos. We probably have something Mexican once a week so I like having this around. It is great in Mexican Street Corn. Tacos + roasted corn + a few chips makes for a fun dinner. I love the tamales and Mr. J and I liked mini chicken tacos but the little one wasn’t as into those. I should try again though. This corn is often a side and I open up some black beans to go into the tacos or on the side too. 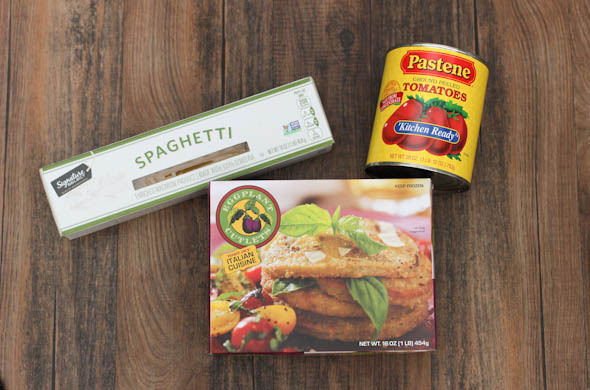 These can be a bit seasonal – I was shocked to find Marsala sauce a second time, but the Trader Joe’s bottled items are really fantastic and great time savors. When I had just a little leftover marsala sauce, I added some veggie broth, mushrooms, and marsala wine to stretch the leftover sauce a bit. I was inspired by a balsamic & fig dressing and can definitely put this Island Soyaki to work. I grabbed Chili Lime seasoning and the umami seasoning to try them out. I make my own Everything But the Bagel but that is a fantastic one too! Having a sauce on hand can really make basic dinner items come together quickly. 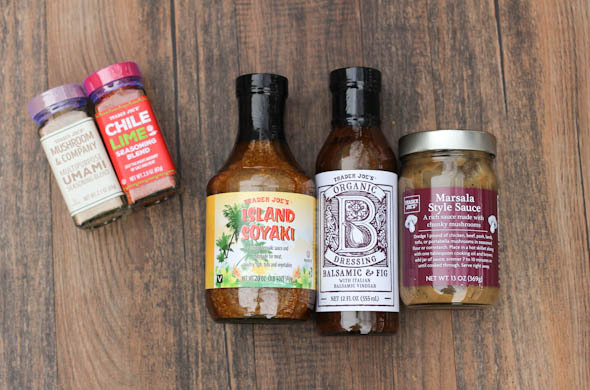 Adding any of these sauces to some turkey meatballs over rice or egg noodles would make for efficient meal with salad or veggie of your choice. 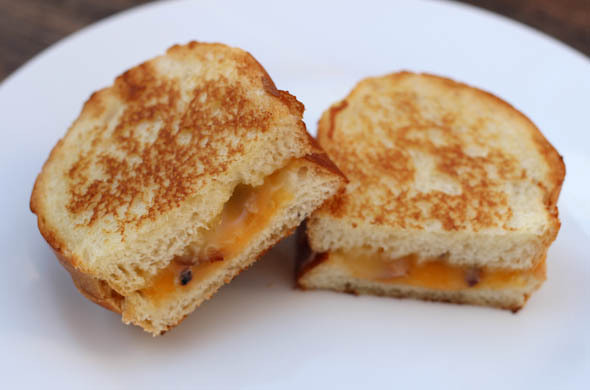 Or using a sauce with chicken to become a sandwich or panini would be delicious. 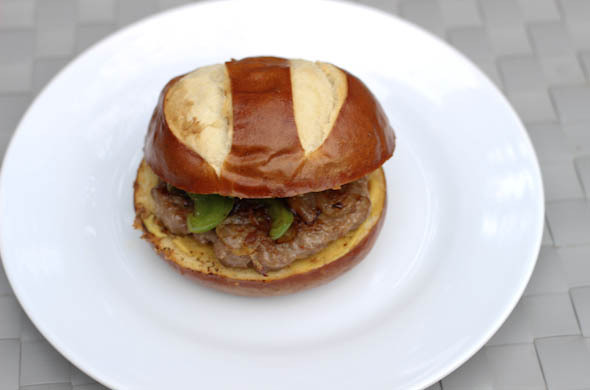 Their bakery items are also great- the focaccini rolls are super soft and a fun way to elevate a sandwich or the pretzel buns with sausage & peppers is so good. I always grab some snacks. The sesame sticks are a constant and I like their trail mix variations into portioned packs. I can’t ever get over how economical their cheeses are! I sometimes grab frozen fish and the refrigerated pastas are helpful to be quick dinners too! Happy shopping! What am I missing? Any favorites of yours? February seemed to just roll right along. The end of February means my birthday is right around the corner! Bring it on! It has been strangely rainy without too much snow. I’ve tried to get outside as much as possible and I think it makes a world of difference for myself and the little ones. I wish daycare could take the preschoolers out more – there’s some magic temperature they have to go by but I have more faith in our hearty little New England babes than the temperature suggests! This crispy fish rice bowl was prob my fav thing I made all month. It was on repeat a few times! 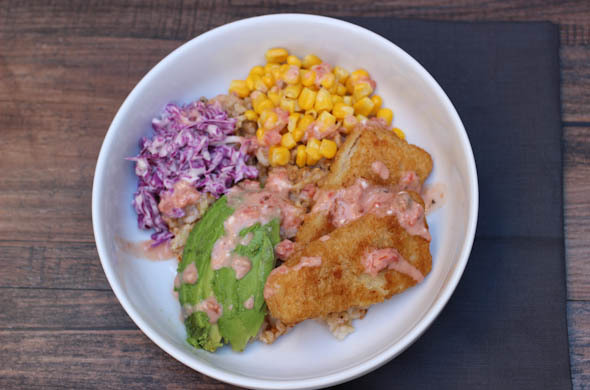 I transformed a fish taco concept into a rice bowl and loved it. 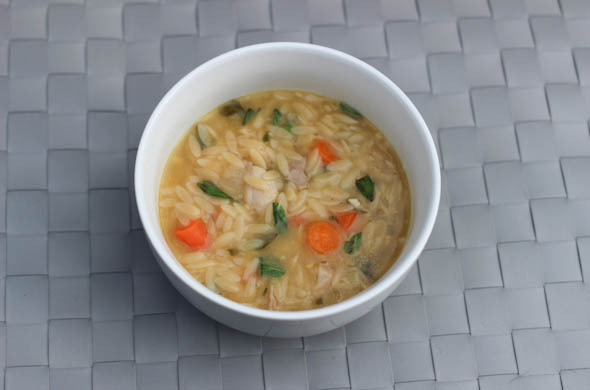 This Greek Orzo Chicken Soup with Lemon was such perfectly. I prepped it to be lunch for a few days and found it comforting with more flavor and interest than it even looks like! I have some good stuff ahead for March – an appetizer that turned into dinner, and maybe a smoothie. I’m going to test out a breakfast option so we’ll see how that goes. She’s such a smiley baby! Her party tricks include sitting and rocking back and forth on all fours. Baby girl wants to move! She’s sleeping like a champ even since we swapped out the magic merlin suit (which really is magic) so now she rolls all around and can re-discover her pacifier to settle back into sleep. Baby C tried cereal and loved it. She’s had some purees too and loves eating them and wants to do the spoon herself! She looks so big sitting in the high chair with us at the table! There’s a tooth coming in! I just went through her next size of clothes and realize I don’t take her to nearly as many formal occasions as other people who hand down dresses with tulle. Her fav toys are an activity cube with a mirror, and rubber toys to chew which look SO much like dog toys. She LOVES the tub and will kick her feet to splash for as long as we’ll let her. I’m shocked to say he’s really not into rice/grains at the moment. He wants pasta whenever he gets to choose. I loved seeing him jump right into the crispy fish in a taco. He didn’t eat much on a his/hers night of steak & salmon but tried each without any prompting from us. Then he went to town on chicken and black bean enchiladas one night and pulled pork another night so it is safest not to assume anything. He loves the snow and is enjoying winter. We took him to a Paw Patrol Live show and he was enthralled in his way of quietly absorbing a new activity. He’s been great in his toddler bed and takes the ok-to-wake rule of his light/sound machine very seriously. He stays in and calls out “mommy daddy, my light is greeeeen”! Year of ___ decluttering/minimizing/organizing: My closet feels like shopping with matching hangers! Next I have my sights on the kitchen utensil drawers. Feeding Littles: The pre-schooler was trepidatious but loved the Copycat Cracker Barrel meatloaf. The combo of getting dinner on the table and not having phones at the table is tricky for photos since I also don’t want to interrupt a hungry little guy. Work on advanced food prepping: I’ve been on top of prepping some things in the morning. Even clustering ingredients in the fridge or from the basement freezer is helpful. What I’m reading: I read The Girl with Seven Names for bookclub and The 57 Bus and All We Ever Wanted. What I’m watching: We watched a few movies- Bad Moms Christmas, Gone Girl, and Crazy Rich Asians. I loved Bad Moms and wasn’t impressed by Gone Girl as a movie. Crazy Rich Asians was pretty good, but much better as a book. I caught up on a few Project Runway All Star episodes and loved them. I haven’t done any Bachelor this season- am I missing anything? I’m loving a CNN series of the 1980s- which seems like a necessary refresher for politics in our lifetimes, and have the 1990s next. I really think I could have benefited from more US history and government education instead of Mesopotamia, or so much on ancient Egypt, or all the hours I spent in early art history being quizzed on cave drawings- don’t get me started on Shakespeare’s Histories and Tragedies or astronomy which never covered any stars. January is fun for us, not the holiday-letdown that I hear others speak of. My little boy is 4! We celebrated with a family party for him & his cousin to jump at the trampoline park and pizza and cake at home. Another weekend we had a trip to Maine. Mr. J and I went out to dinner at a new-ish Mexican restaurant in our town and we looooved it. Now it is almost February! I have to come clean. I was going to sneak meatless tacos in one night but Mr. J unloaded the groceries. I was being secretive but Mr. J will try anything so I didn’t really need to be. They were a hit! I love tacos as a meatless option since it is so much faster to get ready (especially from frozen) and a meal where the flavor and texture is really fine. I fully recommend this beefless ground with some taco seasoning added in and a splash of salsa. Seriously, I bet you could fool anyone in a taco or nachos. This infographic blows my mind for environmental impact of eating meat. While we’re not going vegan over here, the water use, deforestation, and climate change all make me know I can do more. Cranberry Walnut Chicken Salad was a nice change for lunch. Just because it is January doesn’t mean we don’t need something sweet, right? 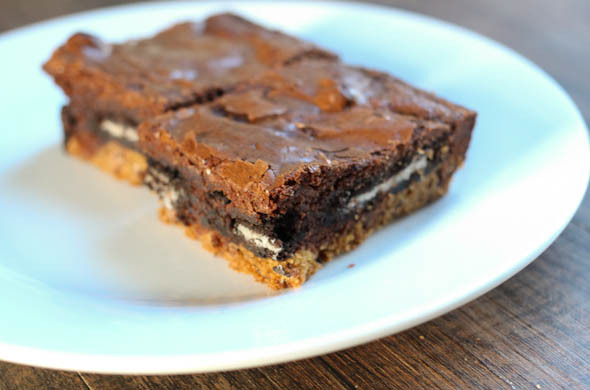 Everything Cookie Brownie Bars to the rescue. 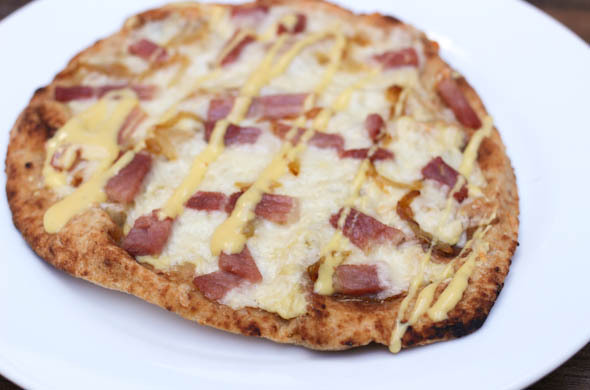 Quick Ham & Cheddar Pizzas with a Mustard Drizzle hit the spot for a cool winter night. For February, I’m excited for superbowl snacks and I have some really great posts to work on. I’ve been stumped on breakfasts so I need to get myself more creative & easy options. I never want winter smoothies, it is just too cold. She’s doing so well yet I thought she’d weigh more at her last weigh-in, but she’s happy and healthy. She’s 12 pounds and super smiley. We’re now letting her sleep at night until she wakes hungry. Sometimes that has been the morning, other times it is a night-time feeding. 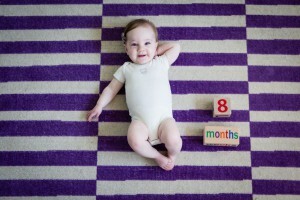 She barrel rolls across the floor and can hold herself up with one hand while reaching with the other. Baby girl wants to move! We just set up the high chair and I think she’s enjoying being up to the table while we eat. Mostly, she just likes seeing exactly what her big brother is doing. We want to let her play with baby cereal but she naps 6pm-9:30 has a bottle, then sleeps. Maybe this weekend!! He loved his birthday and then REALLY loved dancing to a DJ at his uncle’s birthday! I couldn’t get over my sometimes-shy-guy bustin’ a move on the dance floor. He had a fun Children’s Museum adventure with his Auntie and true to his nature, wasn’t sure he wanted to go when he really thought about it the morning-of. I knew he’d love it and he did. He’s currently obsessed with these new Cheerios. Our big guy wants his tacos regular sized (I used to cut a flour taco into mini triangles to be easier to hold) but he wants them in a taco stand and takes bites. The other night he ate 3 tacos! We transitioned his crib to a toddler bed and he’s done great! He doesn’t get out until his sleep machine turns from red to green, and even comically announces “my light is green” and waits for us before getting up. It is too cute. He is loving that baby sister can hold toys now. Year of ___ decluttering/minimizing/organizing: I’m not all Marie Kondo but folding by drawer-clothes to see them all is so great! My closet is next. Feeding Littles: I posted a few, this Peanut Sesame noodles & edamame and Meatless Tacos which are each crowd favorites around here. Work on advanced food prepping: ehh. I can do more. What I’m reading: I read My Name is Lucy Barton which was lackluster. I read Today Will Be Different. Bookclub read The Power which I went back and forth on – definitely different than ones I pick myself. Mr. J is a reading fiend right now- like a book every few days! What I’m watching: I’m behind on my favs A Million Little Things and This is Us. I might have to accept that I just don’t have the time for the Bachelor. Maybe I’ll jump in a few weeks from now when there are fewer contestants and I’m not 6 hours behind. We watched The Big Sick and loved it so much- I laughed, I cried, I’d watch it again. The big thing is we got rid of cable. Mr. Roku saved us a chunk and might mean we’re a bit more strategic too versus DVR feeling like a to-do list! Ok, 2019- We’re onto you! Happy New Year! As much as the clean slate and encouragement to do all the right things feels exciting it can also feel overwhelming. Suddenly we’re supposed to switch from Christmas cookies to all the kale salads? My plans for the upcoming year usually start in November, with my blogaversary but after some post-holiday clean up, I was feeling jazzed and inspired to help for those whose resolutions include the kitchen! By now we’re definitely into January but the number date doesn’t have to dictate when to get started on good habits! I’m interested by the idea of a word for the year and I’m loving the lists of “more XYZ; less ABC” as a way to set some intentions versus specific goals. I asked on instagram what some food/kitchen related resolutions were which led me here! also, write it down! It helps you plan, shop, visually see what’s ahead (so you can prep ahead somewhat) and anyone else who is eating can see it! my fav grocery app (Anylist) is now on apple & andriod! Hallelujah! We tried so many when we weren’t both on iphones. You can share the list with family members annnnd save a photo with an item- if you’re super particular about say, pita bread, like me! You can even connect recipes so you shop for all the groceries. I keep lists for groceries, Costco, Trader Joe’s and Target. 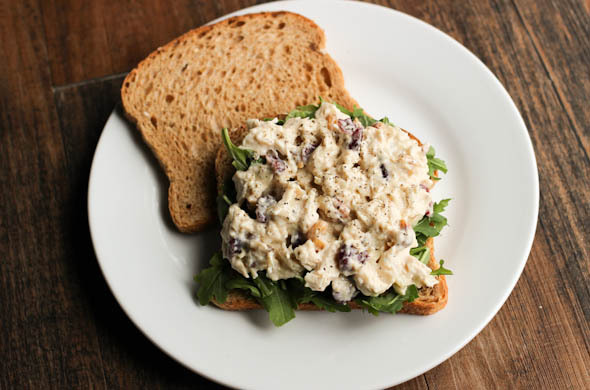 Cranberry Walnut Chicken Salad is perfect in a sandwich, wrap, or on a salad. 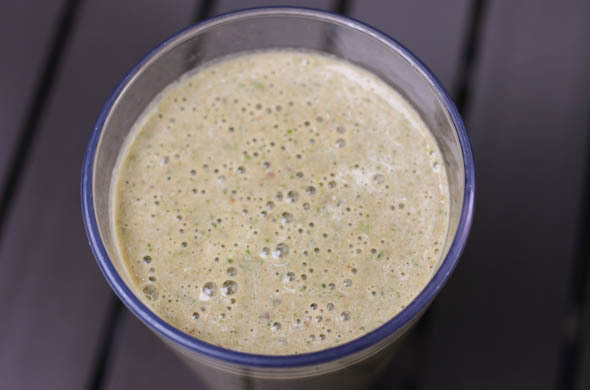 Blender: Peanut Butter & Jelly Smoothie is my fav, and starts the day with a fruit, a veg, yogurt – perfect! Pressure Cooker: 6 minute risotto made into bacon, white cheddar, and everything bagel seasoning risotto topped with an egg is the best. (like me!) I’ll be sharing some of those tips on instagram. Don’t feel the January pressure to do all the things. Take something that you WANT to do and just stick to that. Or pick a new resolution or intention for each month! Howwww is it the end of December?! I think this was the fastest month of the year! Fingers crossed I can get photos of a bunch of menu items during my week off from work. Christmas was magical. I think 3 (almost 4) years old is quite possibly the most ideal age for Christmas wonder. Our little guy loved seeing the lights, decorating the tree, and meeting Santa. Baby C was so happy and napped and ate pretty well considering it was an unusual day. Christmas day was great. Christmas eve we hosted dinner at home and making fresh pasta has become our tradition for the last few years. We made ravioli and crockpot meatballs. Dad made his signature antipasto and Mom made all the cookies. December was busy with almost-final touches on the basement renno, social gatherings for dinners out and holiday parties, and busy at work. I really tried to balance Christmas being a magical time with what is actually do-able without adding stress. I decorated a bit less, we didn’t get lights onto the house, visiting Santa was suuuuper late, but the kiddos can’t understand a calendar so it is OK for this season of our lives. More and bigger wouldn’t help anything except for making stressed out parents. The basement renno is allllmost done. It is in the final stretch. It is livable and just needs the tiniest of details. After the first overnight guests we may settle more toys there though having family helps us (cough, all credit to Mr. J) get the last items done. I’ve tried to “own” meals/laundry/gift wrapping while he’s taking on all the projects! 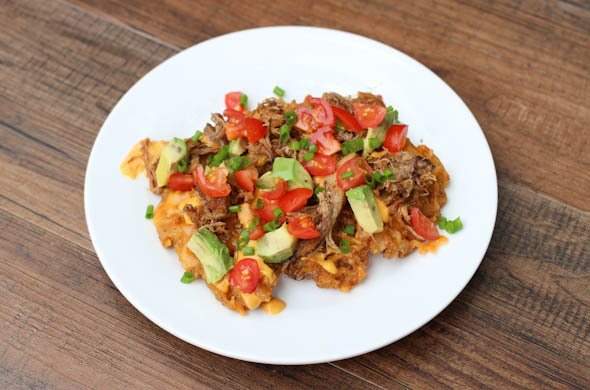 I think everyone needs loaded waffle fries on a menu, even if just for lunch. 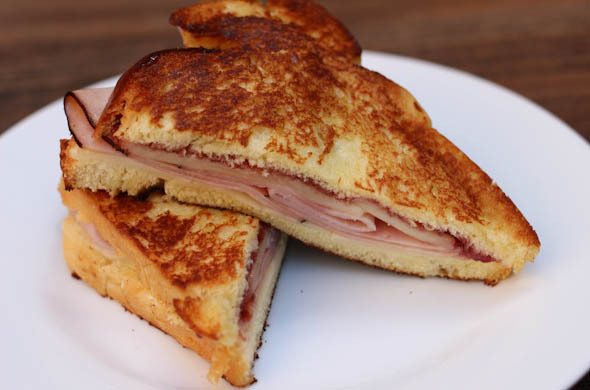 I made an easier-than-expected Monte Cristo Grilled Cheese and hope that it reinvents leftovers from Christmas! 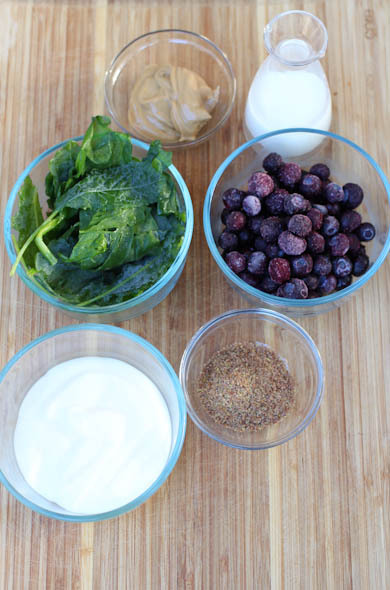 This PB&J smoothie is my favorite. I rarely make any others now that this one feels perfected. Work closes between Christmas & New Years, which is awesome for time home, and also since I’m at a negative balance from maternity leave. 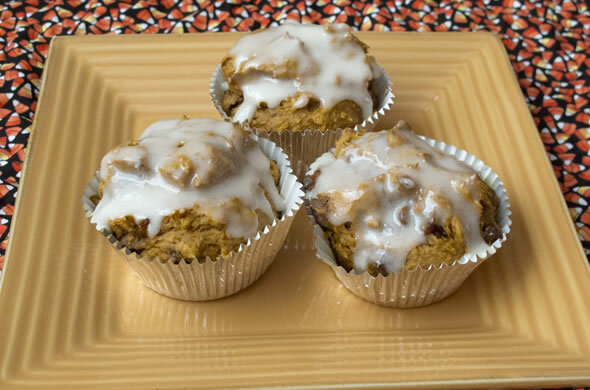 I hope to enjoy the time and to get a few recipes blogged (I have a dessert, a pizza, and maybe a soup on my list! ), stock the freezer just a bit, and get a few things done. He moved up to the next class at daycare which is awesome. Such a big kid! We put his play kitchen into the basement and he is loving cooking for us! He is suuuuper into tools and kept very occupied by poking holes with a screwdriver into our broken-down cardboard. He got to watch his first movie! We watched the original, animated How the Grinch Stole Christmas. He loved it. For food, he loves eating his gingerbread house and all the treats of the season. Meat-less tacos didn’t phase him and I was glad to see him eat them as is, and not deconstruct them to eat elements separately. He liked “fancy toast” which means nutella. He was so excited for Christmas and couldn’t wait to leave cookies for Santa. His birthday is coming right up which might mean that at 4 years old, we maybe should give up the crib. I had hoped we’d get to be sleeping through the night before the effort of teaching him to stay in bed, but alas, someday. She’s suchhh a happy girl! She’s very chill, very smiley, and eating better. We’re on a better dosage for reflux. I think she loved being held by all the family for Christmas. We have a good routine going in the mornings and after work. It feels like a relief to know what to expect with her now. Daycare loves her because she’s so sweet and doesn’t cry. Year of ___ decluttering/minimizing/organizing: 2 donation pick ups helped move things out but we’re not 100% settled into the basement yet. Almost! I’m glad to report our wetbar is cleared off now that we moved into our desks in the basement renno. Feeding Littles: I wish I did this more. I’ll keep at it. Dinner is just such a rush to get onto the table and I try not to have screens at the table! Here’s one! What I’m reading: I didn’t read all that much this month. I’m quite far into What Happened by Hillary Rodham Clinton but it is ohh so long- I’m about 400 pages into the 600ish pages. I may call it done and move on. What I’m watching: Christmas movies! Christmas with the Kranks is a fav and so underrated, in my opinion. We rushed to squeeze in a few other favs like Home Alone, Elf, Christmas Vacation, etc. November meant the end of maternity leave and back to work. My blog also turned 8. Woah! We were getting into our groove again, and we continue to. 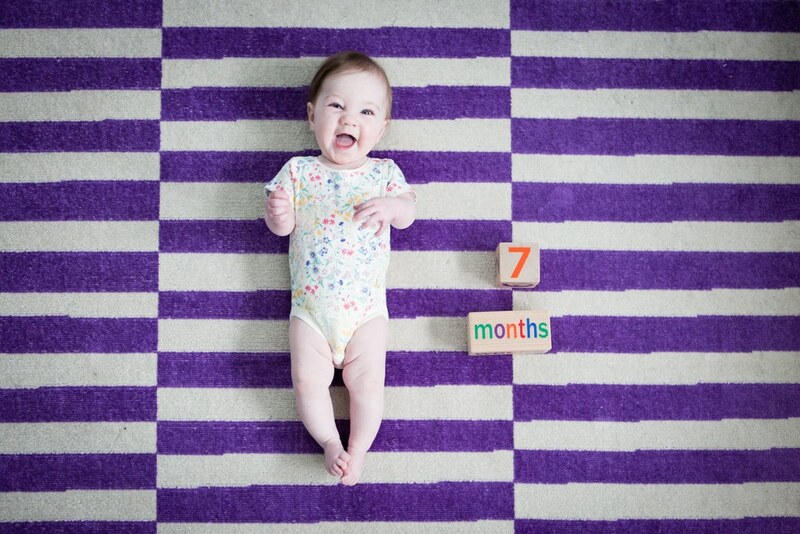 The babe got used to her reflux meds and either that, or eating a little more, or hitting the 3 month benchmark, or sleeping a bit more, or all have made a world of difference! We are THIIIIIIS close on the basement renno being done. Can. not. wait. We all are anticipating space: lounge area with a TV; play area with the train table, play kitchen & toy storage; laundry room; powder room; desk space; and storage space. It has taken foreverrr. The end is in sight!! I’m itching for big time organization, cleaning, and getting things settled that have been in limbo for months! Ok, onto the food. 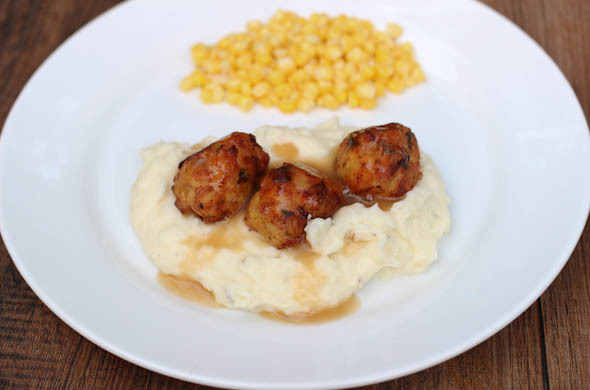 Our fam fav dinner this month might have been these Thanksgiving meatballs! 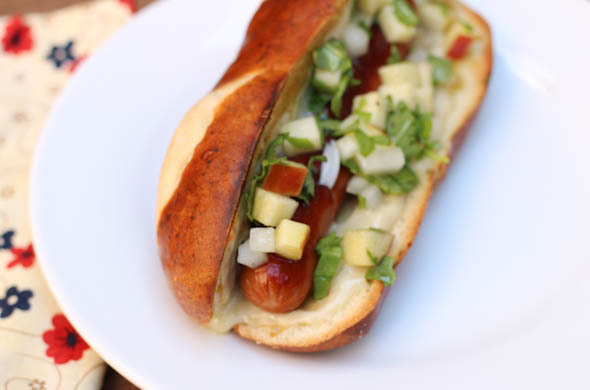 This fall hot dog with apple slaw was super fun and I hope it graces somebody’s football game watching! 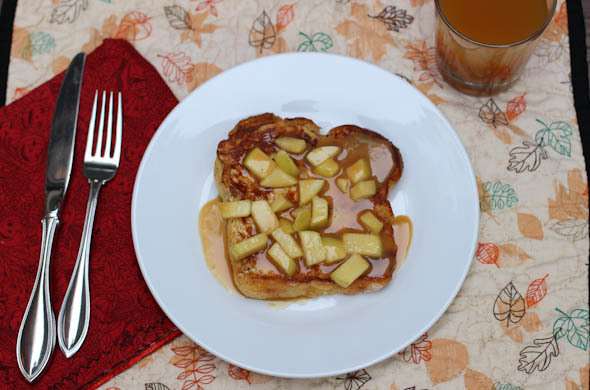 French Toast with Salted Caramel Cider Sauce is so good, and very fall-winter-ish. December is such a fun and busy time of year. 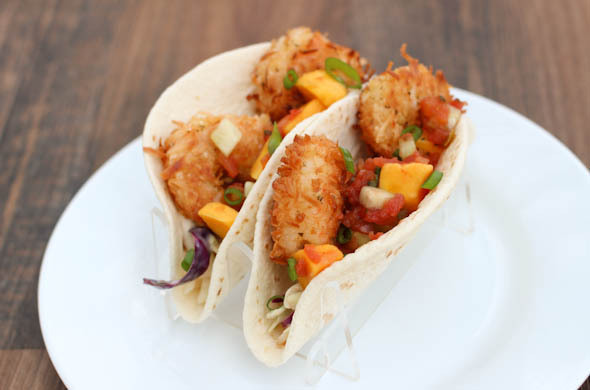 I’m bringing you some quick meals that can use leftovers or work as a cook once, eat twice plan for you. Maybe something healthy will sneak in there since there’s enough party food elsewhere? We’ll see! He had some rocky days of listening at daycare. I wish toddlers could express themselves! I think we’re back on track. He’s been into play-doh, knex, and working outside with Mr. J. Meat isn’t always his fav but he liked chicken marsala with sauce from Trader Joe’s and he ate the Thanksgiving meatballs. I loved seeing him assemble his plate like ours. He often wants foods a bit separate so it was cute to see him imitate our plating. It was fun seeing him take bites of a big burrito and I wrapped the bottom with foil for him to hold telling him that’s like at a restaurant. I’m working to ensure foods he likes appear in other formats, hence, the burrito. He’d eat pasta every night if we let him decide. Edamame in the shells are so fun to him. He’s pretty adventurous when he encounters foods he doesn’t remember or doesn’t have all the time- i.e. soup, lasagna, eggplant, shrimp etc. I love when he tells me dinner is SO good. She’s sleeping like a rockstar in the Baby Merlin’s Magic Sleepsuit! She started rolling when swaddled and giving us a heart attack! The first day sleeping in the suit she napped more in that day then the past several months of her entire life. She’s finally done with that infant nightly meltdown and I’m ever so grateful. I’m hoping we can let her sleep through the night once she weighs a bit more. 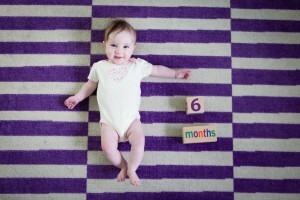 She got to a double digit weight- 10 pounds at 3.5 months old! She’s super smiley to all of us and cracks up seeing her big brother! She just needs to eat more. Year of ___ decluttering/minimizing/organizing: November kicks off by sending a ThreadUp batch full of maternity clothes to say goodbye to! Feeding Littles: I only did once or twice in Instagram stories. I’ll keep at it. Work on advanced food prepping: yes! I got a leg up when Mr. J was home and could turn something on. I prepped broccoli & cheddar soup one morning before we ate it that night and getting chicken cooked to just warm in marsala sauce was hugely helpful. What I’m reading: I read Himself for bookclub and didn’t love it. I read Educated and Crazy Rich Asians couldn’t put either one down. What I’m watching: Now that our little lady naps, we’ve watched some several-months-old DVR! I cannot wait for Dec when I’ll be into Christmas movies & music! My little blog is 8! How crazy is that! I love this hobby and am so glad you’re here! This was a big year (new baby! new job! basement renovation! big trip to Zion!). I’m ready to now dive deeper into where I am at this season of my life. I have a lot I can build on and I’m so so happy where I am so no big changes ahead (fingers crossed)! I haven’t really set out with super grand plans for the next year of the blog but I’m thinking I’ll keep on going as long as it is fun! Switching to once a week feels like a do-able and sustainable schedule. I refer back to my own site often and I’m never out of ideas. It is useful to push myself and I absolutely love hearing from people who tried something or have an idea for me. Without further ado, here are my totally biased superlatives and next year’s goals at the end! 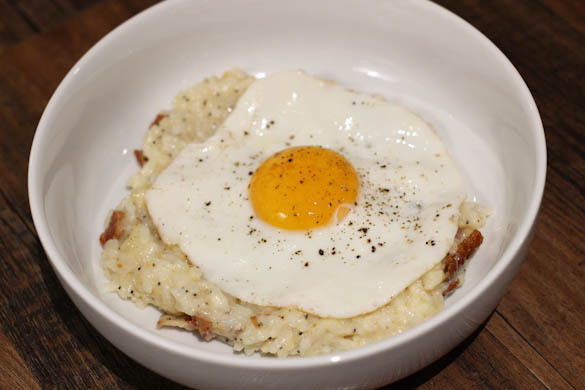 Most repeated dish: Breakfast risotto with bacon, white cheddar, everything bagel seasoning and an egg. Taking time to blog thoughtfully: I’d say I did occasionally. What I’m reading: I’m up to 24 books read this year (follow my books here)! The upside of being awake so much when I was pregnant was reading a ton. I don’t anticipate as many next year! Mama needs some sleep! What I’m watching: I really got into American Crime Story when they did Gianni Versace this year. I didn’t actually binge as much during maternity leave as I thought I might but watched some of The Crown and some of Big Little Lies. Year of ___ decluttering/minimizing/organizing I normally treat myself to something (earrings/candles/seasonal decor) but after the world’s longest basement renno, I’m craving a spot for everything and now that the baby is here, we know what we need and what we’re done with. November kicks off by sending a ThreadUp batch full of maternity clothes to say goodbye to! Feeding Littles: I got great feedback on toddler lunch packing and toddler dinner ideas so I’m hoping to incorporate those onto the blog more since our three-year-old is served what we’re eating. Work on advanced food prepping: I do this a bit, but after work is not a time I can do much cooking on weeknights. I need to be a step ahead! What I’m watching: I’ll probably set my next goal for 18 books since that’s what I did in 2017 and still feels lofty enough. The end of October also brings the end of my maternity leave. It is bittersweet. I’ve loved my time with my babe and feel like I’ve made the most of it. I also love working. I’m so grateful for the job I have and feel really at peace to return. I learned with our little boy that working is really right for me. Once I got my footing with a newborn and toddler, I cooked some fun things and I’m psyched for what I have prepped for the blog! I’m feeling great about one post a week being sustainable. I’m prepped well ahead so I can enjoy the blogging process, have room to keep going, and to not feel stressed. I have a few very seasonal meals up next! 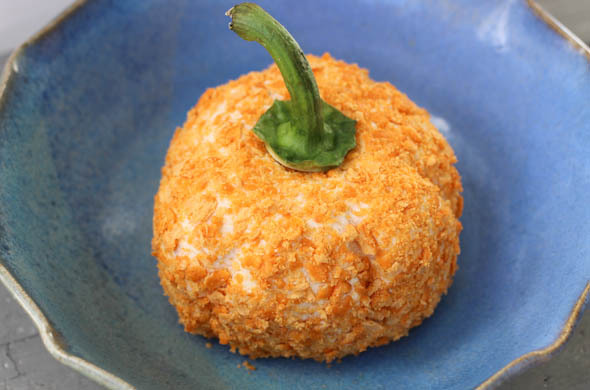 While not made this October, but blogged >365 days after the making, the cutest Pumpkin Shaped Cheddar Cheeseball got to grace the blog! 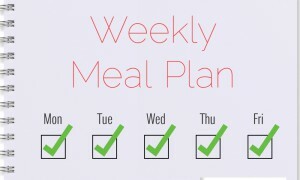 I also toyed with the concept of a capsule meal plan and fell in love! This season for my life was screaming for some structure while meal planning. Obviously I care a ton about our family eating varied foods together at the table so this bit of structure to plan really helped me. I’ll continue to plan weeknight meals with nights of: pasta or pizza; Mexican; anything goes (aka, leftovers or the easiest thrown together dinners); and whatever else seems good to add in that particular week. Try it. Tell me what you think! 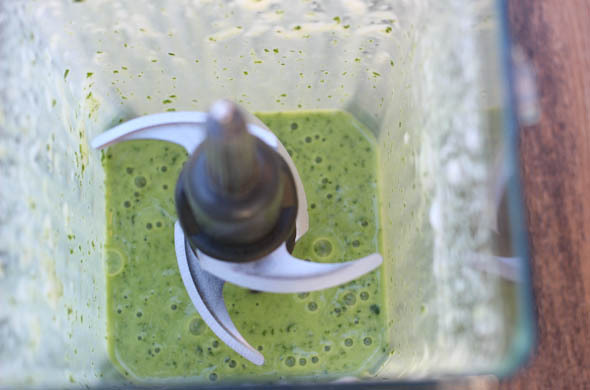 I made a fun Chocolate Mint Smoothie to use the mint that was still flourishing in my garden. 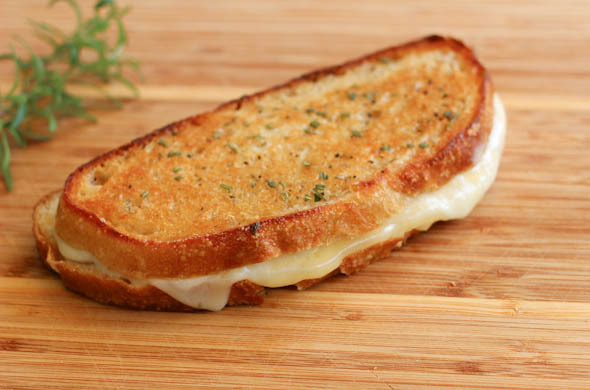 Plus, this month had a French inspired grilled cheese that has a truly pumped up flavor. He’s so interested in rhyming which is funny. He can hear it in books but when figuring out his own words that rhyme is comical. He loves pealing his own banana and has been eating really everything. I got these marshmallows and he has loooved them as treats. He’s pretty psyched for Halloween. We got to go to a few fun events at the library since I’ve been home. He thought the book Cloudy with a Chance of Meatballs was hysterical. I get a kick out of his love for being cozy- me too! He’ll do anything for the prospect of getting cozy- get those jammies on after the tub so you’ll be cozy, put your jacket on so you’ll be cozy, etc. 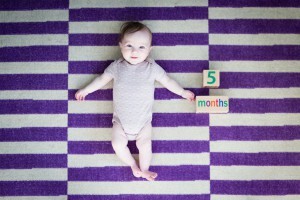 She’s close to 3 months old and will start daycare soon. We joke she’ll learn to nap there. She’s very smiley and sweet- especially since she really doesn’t sleep much during the day. We are trying to get her to eat more. She’s itty bitty. I swear she’d pretty much sleep through the night if we didn’t have to wake her to eat. Once she gains some weight we’ll be able to stop waking her. She loves the tub when we put her in with her big brother. She hates getting her nails trimmed. Taking time to blog thoughtfully: ehh. blogging at all at this season is an accomplishment in my book.